A pencil will write in zero gravity, upside down, and under water! More than 14 billion pencils are produced in the world every year - enough to circle the globe 62 times. One pencil will draw a line 70 miles long. Pencils don't really contain lead.That gray matter is graphite and clay. Famous novelists Ernest Hemingway and JohnSteinbeck used pencils to write their books. Pencils didn't have erasers on them until 100 years ago because teachers felt they would encourage children to make mistakes. The average pencil can be sharpened 17 times, write 45,000 words or draw a line 35 miles long. In 1908 A.C. Steward developed a press that could imprint round pencils. Seeing a pencil in your dream indicates that you are making a temporary impact in a situation. It may also suggest that a relationship may not last long. Dreaming that you are sharpening a pencil, suggests that you need to be more flexible in your way of thinking. More than 2 billion pencils are used in the United States every year, and most of them have erasers! However, most pencils sold in Europe do not have erasers! Pencils can write under water, but on what? I dont think the paper will still work under water. Also, you state in one part that they can draw a line 70 miles long, and in another that they can draw a line 35 miles long. At other commenter, It says what it says. Oh well. You might think it wrong others might think it right. Really interesting! Helped me a lot on my work. Really interesting! Helped me a lot with my work. This really helped me with my work, except for when it said 35 miles for one and 70 for another. Plus, what would the pencil write on under water :s? Oh, well. It helped me, anyway, and that's what mattered. Why does it say in one prat a pencil can draw a 70 mile long line, than in another part it can draw a 35 mile long line. Whoever wrote this just got random facts of the internet and copied them onto a blog. Thanx it helped me - any more facts 100% true? I am doing a speech about pencils and they can draw a line 35 miles long, not 70. Other than that this website was really helpful. Hi. I am in fifth grade. I am doing a presentation on pencils and this really helped me with the fun facts slide. I think that these facts are fun, interesting, and cool. Thanks for the facts!!! 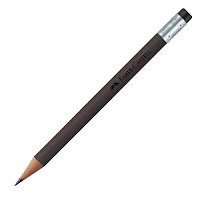 Pencil Lead is made up of Graphite. Frenchman, Nicolas-Jacques Conte has evolved a procedure to make the pencil leads.